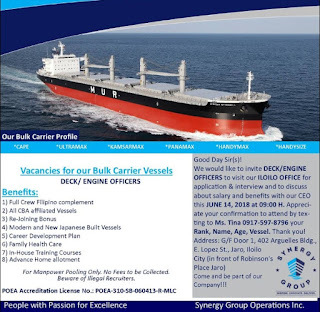 SYNERGY GROUP OPERATIONS, INC. 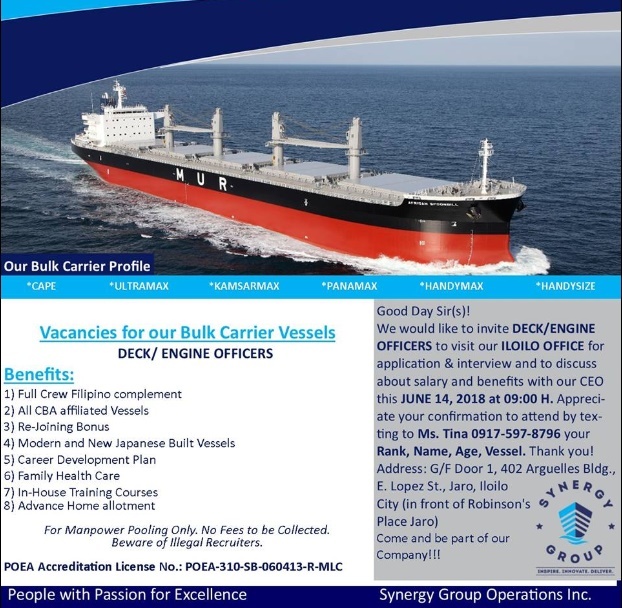 Opening recruitment deck and engine officers in PANAY, GUIMARAS, AND NEGROS OCCIDENTAL AREA to visit our ILOILO OFFICE for APPLICATION & INTERVIEW and to discuss SALARY & BENEFITS with our CEO this June 14, 2018. G/F Door 1, 402 Arguelles Bldg., E. Lopez St., Jaro, Iloilo City (in front of Robinson's Place Jaro) - Philippines. 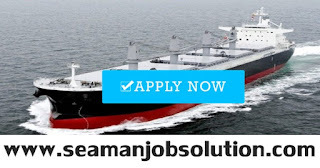 0 Response to "Recruitment Deck and Engine Officers For Bulk Carrier Vessel"